What's it about? 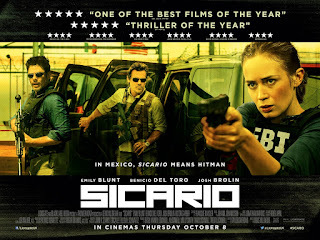 Idealistic FBI agent Kate (Emily Blunt) volunteers to join a special task force to tackle drugs-related activity along the US-Mexico border. Only problem is that neither the swaggering seen-it-all-before group leader Matt (Josh Brolin) or the mysterious 'advisor' Alejandro (Benicio del Toro) seem inclined to tell her what exactly they are doing. Is it any good? 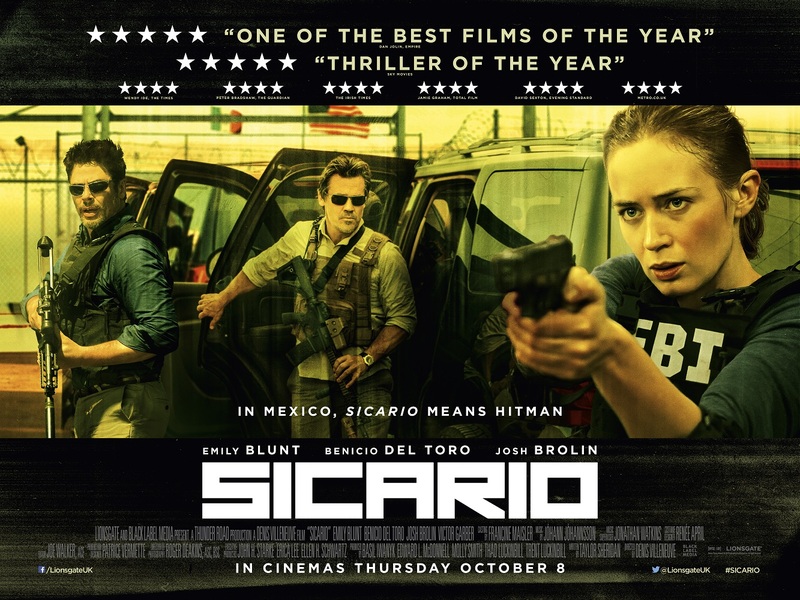 First and foremost, Sicario works terrifically well as a thriller, with several superbly staged set-pieces which will have you gripping the arm-rests as events unfold, all accompanied by a thumpingly sinister score to help ratchet up the tension. It may not tell us anything new about the dangerous War on Drugs across the US-Mexican border - we've seen all that murky, corrupt stuff in everything from Traffic to Breaking Bad - but it sure as hell make sure it re-tells it with considerable verve. As a story it's less successful, with some clunky, slightly implausible developments and thin characterisation. Nevertheless, Blunt does her best in the rather thankless expository role and the reptilian-cool del Toro is never less than absolutely awesome, even when he's sticking his finger in another man's ear. But the real star her is 12-time Oscar nominee (and 12-time Oscar loser), cinematographer Roger Deakins, whose photography makes even the horrible scenes look beautiful. As it switches from aerial shots to panoramic vistas to hand-held POV to claustrophobic night vision to thermal imaging and back, it's never less than outstanding to look at. Get a flavour of it with the trailer below. Surely, this will be his year to win the little gold guy? Anything else I should know? Yes, I have now officially marked Ciudad Juárez off my list of Places to Visit. think I'll get my drugs somewhere else. What does the Fonz think? The Hitman & Her.